The news, announced at its yearly tourism show Y19, comes as Welcome to Yorkshire revealed plans for a major consultation which will help shape its focus and strategy over the next 10 years. The thousand strong audience heard exclusive details from research by the Business School at Sheffield Hallam University, showing that the value of tourism has grown by £1billion in the 12 months from 2016-17, the latest year for which full figures are available. Y19 marked exactly 10 years to the day since Welcome to Yorkshire was launched at the same venue, The Royal Armouries in Leeds. The show looked at how the county’s profile has grown over the last decade and announced exciting plans to continue that success story. It was announced that this summer Yorkshire Sculpture International (YSI) will present seven major sculptures by Damien Hirst as part of the inaugural edition of the festival taking place across Leeds and Wakefield from 22 June until 29 September. Works will be shown outdoors in Leeds City Centre, at Leeds Art Gallery and at Yorkshire Sculpture Park. The Turner Prize-winning artist, who grew up in Leeds, will show Hymn (1999–2005)and Anatomy of an Angel (2008) outdoors in Leeds City Centre and Black Sheep with Golden Horns (2009) at Leeds Art Gallery. Charity (2002–2003), Myth (2010), The Hat Makes the Man (2004–2007), and The Virgin Mother (2005–2006) will be shown at Yorkshire Sculpture Park (YSP). The display of the two works in Leeds city centre will be supported by Leeds Business Improvement District (LeedsBID) and Victoria Leeds. TV star Anita Rani and celebrity chef Brian Turner both appeared on stage with more details on this summer’s huge BBC Countryfile Live event. Making its official Yorkshire debut from the 15th – 18th August it will be largest event ever to be staged at Castle Howard with over 60,000 visitors expected over the 4 days. The show will occupy over 50 acres celebrating the glorious Yorkshire countryside and bringing popular features seen at the sister event at Blenheim Palace such as The Dog Lovers’ Arena, Village Green and Equine Arena to name a few. There was a special Welcome to Yorkshire honour for Sheffield’s Tony Foulds. The 83-year-old won over the hearts of the not just the county but the nation when he campaigned for a flypast to honour the crew of a US airplane which crashed just feet away from him when he was a schoolboy during the war. Tony believes the pilot saved the lives of him and his friends who were playing in Endcliffe Park by deliberately crashing the plane away from them. He has been tending to a memorial to the 10 US airmen for decades. 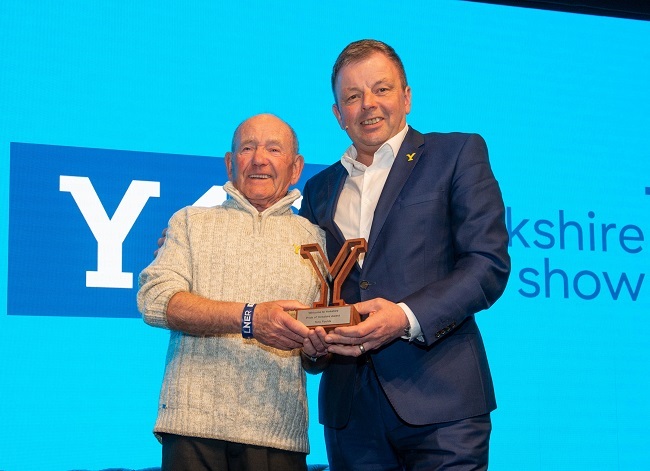 He’s been recognised with a Pride of Yorkshire Award presented to him by Welcome to Yorkshire’s Commercial Director Peter Dodd. We also heard exclusive news from Shakespeare’s Rose Theatre which is back in York this summer for a second year. Theatrical Producer James Cundall from Lunchbox Productions confirmed that they will soon be flying the flag for their Yorkshire success story in the UK when they open a pop-up theatre at Blenheim Palace and internationally when they open another one in Manila. The audience also heard details of what’s coming up at theatres across Yorkshire with a specific focus on South Yorkshire with Dan Bates, Chief Executive of Sheffield Theatres. Garden designer Mark Gregory gave the audience an exclusive insight into what it’s like building a show garden for the RHS Chelsea Flower Show. Mark has designed Welcome to Yorkshire’s 10th garden which is inspired by the county’s rich industrial heritage and stunning canals and waterways for the world’s most prestigious flower show. He also gave details of the support being given to Welcome to Yorkshire by Canal & River Trust, including the gifting of two pairs of genuine lock gates that were once used on the Huddersfield Narrow Canal. A huge year of sport was celebrated at the show, including world class cricket, the Tour de Yorkshire and UCI Road Championships. Cricket stars Tim Bresnan and Ryan Sidebottom discussed a great year for cricket in the county – as Yorkshire prepares to welcome the Ashes and also ICC World Cup. Emerald Headingley will host four World Cup matches in June and July and an Ashes Test Match between England and Australia in August. Exclusive details were released by Andy Hindley, Chief Executive of Yorkshire 2019 of a route change at the para event that is taking place ahead of this year’s UCI Road World Championships. The Yorkshire 2019 Para-Cycling International on 21st September will now pass through the centre of Knaresborough which previously wasn’t due to see any race action. Official artist for the 2019 Tour de Yorkshire, Mackenzie Thorpe, used Y19 to reveal the first ever sculpture to be part of a collection for the race, titled ‘The Fastest.’ He said he was inspired by the speed and exhilaration of racing with the sculpture and accompanying print in the striking Tour de Yorkshire colours of blue and yellow. Alongside ‘The Fastest,’ Mackenzie unveiled two celebratory posters ‘Riders on the Storm’ and ‘Round the Bend’ completing the official collection, which was launched at his Richmond gallery in February. London North Eastern Railway (LNER) were the Official Conference Sponsor for Y19. Managing Director David Horne gave more details on the launch of the Azuma and the greatly improved service which will soon help to bring more tourists to Yorkshire with the biggest refresh of the East Coast line for 30 years. New Azuma trains will be rolled out from the 15th of May with London Kings Cross to Leeds being the first route for the new train. This means the fleet will increase from 45 to 65, there will be over 12,200 more seats on the most in-demand routes – meaning more great-value fares. The trains are a diesel-electric hybrid making them more resilient – leading to smoother, quieter and more reliable journeys.